Mulder Montage offers a full range of services to the manufacturers and operators of escalators and travelators, from transport and storage to fitting. Since November 2015, the organisation has been using ImageCapture for the automated processing of their purchase invoices. Sjoerd Verweij, Financial Controller, talks about his experiences with our software and our organisation. In 1971, before the organisation was known as Mulder Montage, it was a transport company for escalators, ramps and travelators. At the time, it was normal for manufacturers of escalators to carry out the installation of their products themselves. This changed when it became apparent that Mulder could do the installations faster and also more cheaply. So in 1973, Mulder Montage became the company that it is today, being the market leader and all-round service provider for escalators and travelators. 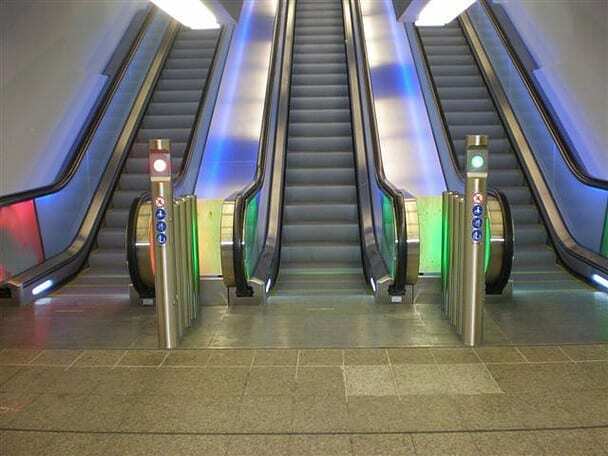 As well as providing extensive services, the organisation specialises in the development of innovative products for escalators and travelators, such as detection systems for starting and stopping systems, and also LED lighting, non-slip surfaces and custom-made floor plates. Over the years, Mulder Montage has developed into a real product expert. No wonder the company now installs over 500 escalators and ramps each year. We are specialised in all sorts of escalators. Our customers are escalator manufacturers for whom we provide the transport, fitting and maintenance of their escalators. Not only are we the market leader in our own area, we are also a major international player. Our work is mainly within Western Europe. Besides our services, we also develop products in the field of escalator safety and sustainability, such as start/stop systems and products to help prevent accidents when escalators are in use. The organisation works on project basis for clients, both at home and abroad. A number of these projects are likely to spark almost everyone’s imagination. Think, for example, of replacing an old travelator in Schiphol airport, installing escalators and ramps for metro stations on the line running north-south through the heart of Amsterdam (an incredible total of 91 of them, including the longest escalator in the Netherlands), and various overseas projects such as replacing escalators in metro stations in Germany and France, and carrying out work on the London Underground’s escalators. Our organisation can best be described as dynamic. We are also well known for our ability to react rapidly. This has everything to do with the environment in which we work. For our scheduling, we can sometimes depend on the progress of construction projects but we also receive ad hoc requests from our customers. Because we have an extensive team of experts available, we are also in a position to deliver on the shortest possible deadlines. The knowledge and expertise that we have accumulated over time also comes in useful in the international market where regulations, for example in the area of safety, may vary from those in the Netherlands. This is then an added reason for clients to choose our organisation. Initially it appeared that a scan and recognise solution would be extremely expensive, but as the company kept growing and the number of invoices increased, investing in an automation solution like this rapidly became economic, and increasingly of interest. Each year at Mulder Montage, between 4,000 and 5,000 invoices are processed and spread across different administrative departments. The invoices are approved by project managers and/or the employees involved. Previously all this was processed manually. Invoices that arrived were distributed around different colleagues’ offices for approval, and sometimes went astray. The paper archives kept on growing, and it was becoming increasingly difficult to find an invoice, or to know where to look. If suppliers called to find out the status of their invoice, the department was not always able to give them an answer straight away. Our people travel a lot, including those employees who need to approve the invoices we pay. So, an invoice might be left lying on someone’s desk while we were searching everywhere else for it. Filing and archiving invoices was also costing us a lot of time. It was especially annoying that we sometimes lost invoices, because they were left lying somewhere or seemed to have disappeared. Another important wish was to move our project administration to a higher level and to make the administrative process simpler and more transparent. On a recommendation from Exact partner Duncker & Munnikhuis, a long-time supplier to Mulder Montage, they opted for the software from Scan Sys. During the selection process, it was not just the software’s price and functionality that were important, but also the positive feelings they had after a number of meetings between both parties. The fact that Scan Sys is a well-known name and expert in Exact helped to seal the decision to purchase ImageCapture software for the in-house needs. Mulder Montage uses ImageCapture for Invoices for automatic processing of its purchase invoices. The invoices are posted at project level, and ImageCapture supports the process by automatically reading the project number on the invoice and linking the relevant invoice to the project it belongs to in Exact. A large number of the projects are international, which means there are also a number of foreign creditors they need to split out. The invoices from these foreign suppliers are also automatically processed by the ImageCapture software. For the digital approval of invoices Mulder Montage uses the approval solution: ImageCapture Web. We have agreed with our suppliers that our project number is to be shown on the invoices they send us. The invoice is then automatically linked by ImageCapture to the project in Exact. This makes it possible to immediately see the costs for each project. The approval using ImageCapture is really nice and user friendly: since day one I have barely been asked any questions about it. One big benefit is that our project managers can log in remotely and see the invoices, even when they are abroad. Previously, invoices would be left lying on their desks, now the project manager automatically receives a message that invoices are ready and waiting for approval. Because it all works so simply, no one finds it annoying to do. I notice that the invoice approvals are now going through a whole lot faster. We can see that the approval process in ImageCapture has become a communication tool. You can add comments to the invoice, and if the invoice is not meant for you, you can send it straight back to the administration department. That has all become transparent now. My experience with Scan Sys has been extremely positive. With the help of your consultant Iloy (ed. Iloy van den Berg) the system was up and running within three weeks! The collaboration worked really well for us. Our whole purchasing process has been vastly improved, especially in my department, where we can see a huge difference, but our project managers are also highly satisfied with the new way of working.